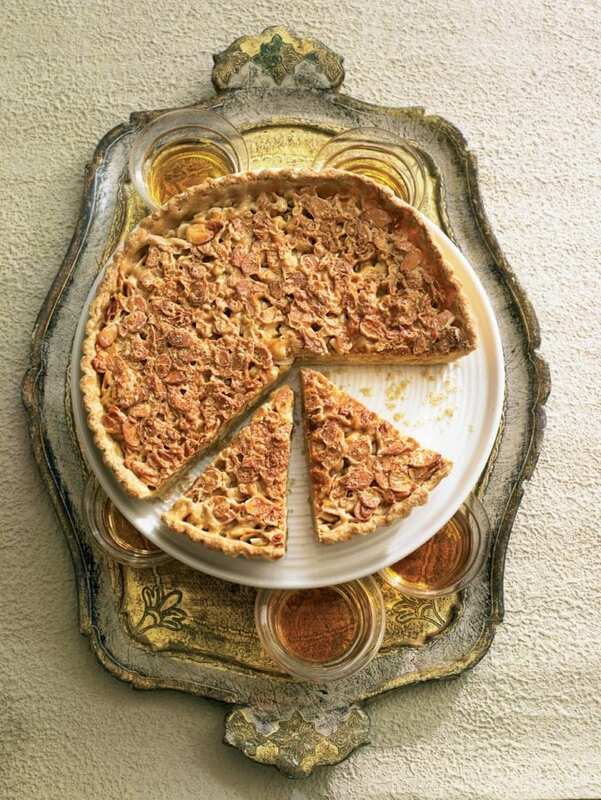 Indulge yourself in sweet heaven with this decadent toffee and almond tart recipe. Whizz the flour, butter and a pinch of salt in a food processor until it forms fine crumbs. Tip into a bowl, add 4 tablespoons cold water and mix until it comes together. Turn out onto a lightly floured surface and gently knead into a ball. Roll out to a large flat circle – large enough to line a 23cm round, deep, fluted tart tin. Prick the pastry in the bottom of the tin with a fork and transfer to the fridge for 30 minutes to chill. Meanwhile, preheat the oven to 200°C/fan180°C/gas 6. Line the tart with baking paper and baking beans, place on a baking sheet and cook for 15 minutes. Remove the paper and beans and bake for a further 5 minutes or until pale golden. Meanwhile, put the almonds, cream, sugar, whisky and a pinch of salt into a medium, heavy-based pan. Stir over a low heat until the sugar has dissolved. Increase the heat slightly and simmer, stirring frequently, for 20 minutes or until the mixture thickens and turns a pale gold. Remove from the heat. Reduce the oven temperature to 180°C/fan160°C/gas 4. Pour the filling into the pastry case and bake for a further 10 minutes or until golden – it won’t be fully set until cooled. Cool in the tin slightly, drizzling with a little more whisky while still hot. Carefully transfer to a wire rack to cool completely. Cut the tart into slices and serve with a scoop of vanilla ice cream or a dollop of crème fraîche, if you like.